Zombies, assassins, and retro games were all the rage on PlayStation platforms in November. 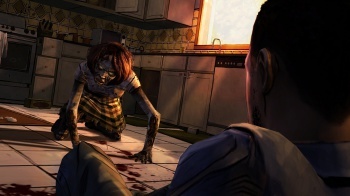 The Walking Dead finished its five-episode run last month, and it went out with a bang, at least on the PlayStation Network. Episode 5: No Time Left topped November's PSN and full PS3 game downloads, with the four previous episodes appearing in the top 20. After No Time Left, the top five was rounded out by Assassin's Creed III, Sonic Adventure 2, Okami HD, and PlayStation All-Stars Battle Royale. The PlayStation Blog also lists sales info for Sony's other platforms. The top three Vita downloads for the month were Call of Duty: Black Ops Declassified, Assassin's Creed III Liberation, and Persona 4 Golden, with recently released PlayStation All-Stars Battle Royale down at number six. And in case you forgot about the PSP, it's still kicking, with the six-year-old game Grand Theft Auto: Vice City Stories leading the digital pack, followed by Persona 3 Portable. When it comes to PS3 game add-ons, the Call of Duty: Black Ops II season pass topped the list. Grand Theft Auto III was the most-downloaded PS2 title, and Final Fantasy VII continues to sell 15 years later, coming in at number one for PSOne Classics (Final Fantasy VIII and IX were also in the top five). Of course, this doesn't represent games sold at retail, but it's nice to see unconventional games like The Walking Dead and Persona 4 Golden listed alongside predictable hits like Black Ops II and Assassin's Creed III. You can get a full rundown of November's digital PSN sales over at the PlayStation Blog.